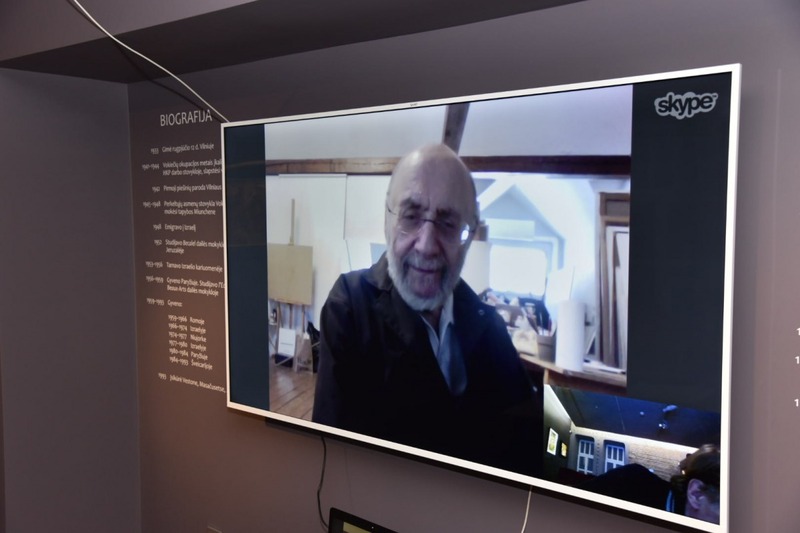 On the last day of January, an extraordinary event was held in Samuel Bak Museum – a telebridge connected the Museum, located in Vilnius, with the painter’s studio, located in Boston, USA. After a guided tour in the Museum, a group of visitors took part in a virtual meeting with Samuel Bak. The internationally renowned Litvak painter gladly answered all the questions the visitors had. He spoke about his childhood in then Polish Vilnius, his family and his creative path. Samuel Bak revealed that he is currently working on a paintings cycle dedicated to candles and their symbolism. He is also trying to finish all the unfinished paintings (around two hundred) until his 85th birthday, which requires him to work 8-10 hours per day, 7 days per week. Samuel Bak shared his vision about the expansion of the Museum, which is scheduled for the near future. The artist has already donated 54 paintings to the Museum and plans to donate much more before the opening of its second expositional space. The next virtual meeting with Samuel Bak will be held in early spring. For more information, you are kindly invited to follow our website and our Facebook page.